I’m postponing Tech Tuesday to next week, Tuesday, April 12th at 6:00 pm, still at the Just Genealogy Fire Pit. What I’ve got to share is just so dang cool, and I’m not quite finished with the presentation — It’s just too neat to share half-baked! Teaser: It involves maps, family history, stories, photos, and did I mention maps??? I know you’ll love it, and thanks for your patience! At tonight’s Second Life chapter of the Association of Professional Genealogists meeting (SL-APG), Craig R. Scott, CG, owner of Heritage Books, spoke to our group about his list of must-have volumes on any genealogy bookshelf. and various other How-To, topic specific books. So often our ancestors traveled in groups with other relatives, neighbors, and friends! as excellent sources of migration routes and patterns to help determine where folks may have come from or gone to. Heritage B ooks has an online store where these and thousands of other genealogy books may be purchased. Go ahead and start your Christmas Wish List now! APG members: Be sure to get your 15% discount code from www.apgen.org under your member benefits! Greetings, Second Life genealogists and family history enthusiasts! Please enjoy this monthly newsletter highlighting some useful research sites, and this month’s calendar of scheduled activities and genealogy events in Second Life. Don’t miss our end-of-summer BBQ & Dance on Monday, August 31st!! The NYPL Map Warper is a tool for digitally aligning (“rectifying”) historical maps from the NYPL’s collections to match today’s precise maps. An UpBuilding Life: The Journals of Montana Pioneer Mary G. Rumping Schenk Schaffer Riordan (1878-1952). 6:00pm – Methodology. Exploring old and new research methodologies with your fellow genealogists gathering around the fire pit in Just Genealogy. Hosted this month by SL-APG chapter president, Gtownma Deed. Discussion will be on the BCG Skillbuilding article by Kay Haviland Freilich , “Background Information: An Overlooked Research Tool,” OnBoard 11 (September 2005): 17-18. Please read ahead, article can be found here –http://www.bcgcertification.org/skillbuilders/skbld059.html. at the FirePit, http://bit.ly/SL_JGfirepit. 6:00pm – NGSQ Study Group. The Second Life NGSQ Study Group focuses on a specific article from the National Genealogical Society Quarterly monthly. Please feel free to attend even if you are a prospective NGSQ member. Co-hosted by Ironhide781 and Ellington Sweeney. This month’s discussion: F. Warren Bittner, “Dora Luhr’s Hannover Origin: A Case of Conflicting Evidence,” National Genealogical Society Quarterly 98 (September 2010): 165-176. We had a lively discussion during Methodology Tuesday at the Just Genealogy Fire Pit in Second Life. Those who missed it are clamoring for the links we mentioned. 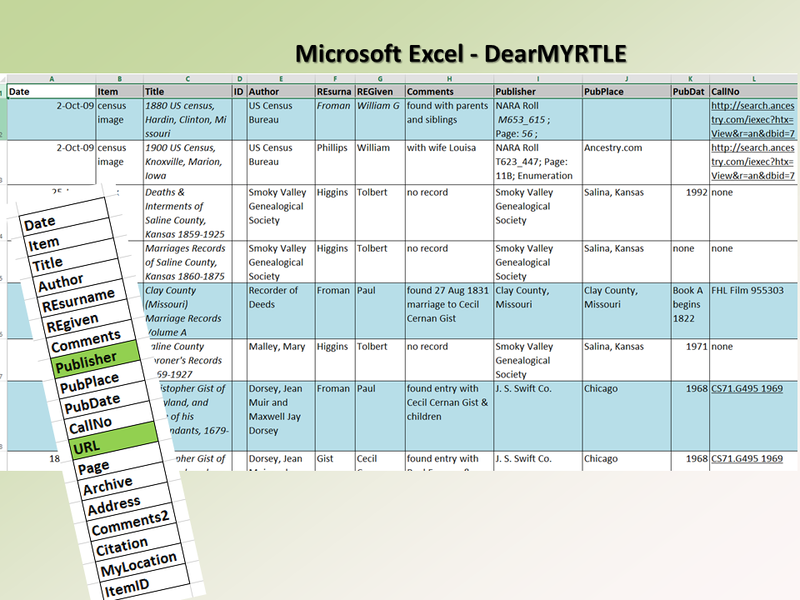 First, here’s a sample of my very distant cousin DearMYRTLE’s research log. She superimposed the column headings she uses on the left side of this graphic. 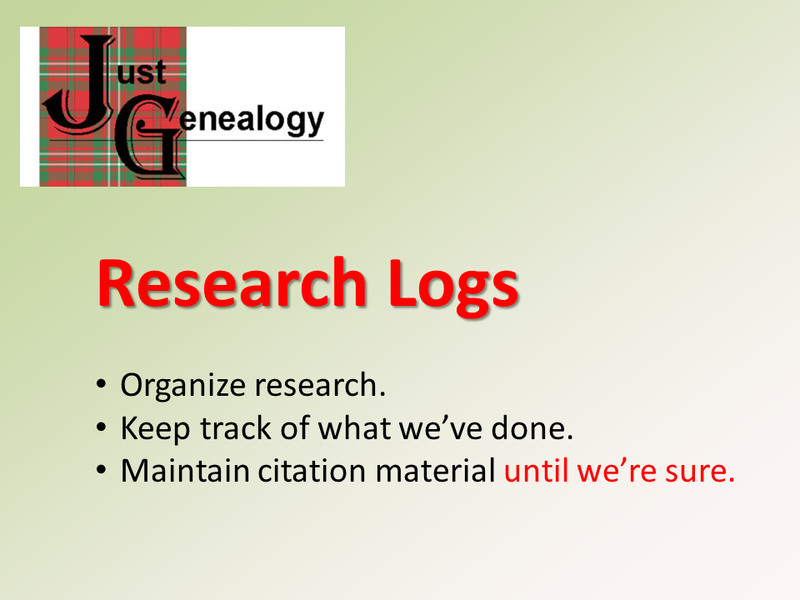 Here’s a short-subject video on Research Logs from the BYU Family History Library. We got this going on our amazing new web-viewing screen at the fire pit. Check out the GeneaWebinars Calendar info on upcoming Second Life genealogy events, in addition to educational experiences all over the Net. Each month we will be choosing an article available online regarding genealogy research methodology to discuss together at the fire pit in Just Genealogy. Next Tuesday, July 21 at 6:00pm SL time (Pacific), we are discussing the Board for Certification of Genealogists (BCG) “Skillbuilding” article by Sandra MacLean Clunies, “Evaluating Web Resources“. The article is available for free on the BCG website. Please read the article in advance of the discussion, and come prepared to share your insights and opinions.